SplitCam webcam software provides a plethora of fun special effects which you can add to your live webcam feeds whenever you are having a video call to anyone over the Internet. 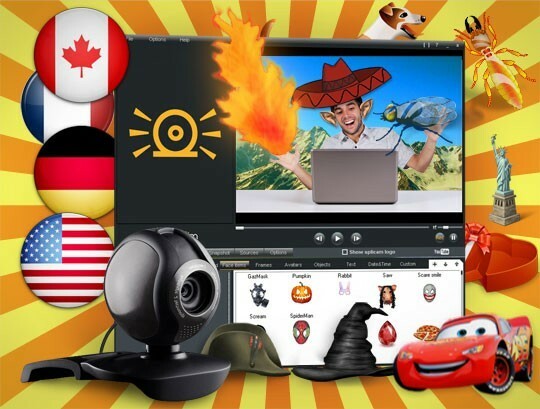 It adds a whole new level of fun to your video communications. SplitCam offers a whole new level of functionality to your webcam by providing a wide range of special effects. It makes video communication over the Internet much more fun and versatile and once your friends see what it can do, they are sure to be impressed! What's more, the person you are having the video call or conference with does not need to have any additional software installed on their computer. SplitCam processes all of the special effects directly with the webcam and on your computer. This also means that it works with any online video chat service or application. SplitCam webcam software also provides some practical and highly useful features such as the ability to broadcast to multiple applications and online services at the same time without receiving the "webcam busy" error message. With SplitCam, you can use other video feeds as a source instead of just the webcam. You can also broadcast the feed from an IP camera or broadcast all or part of your desktop. Learn more at free-webcam-software.com.